(In French, Video on Demand, February 2016) Argh. 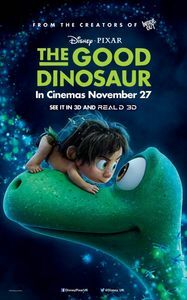 After Inside Out did much to revive faith in Pixar’s rising fortunes after a string of underwhelming films, here comes The Good Dinosaur to put those expectations in check again. The Good Dinosaur certain has its share of good and remarkable moments. As an animated film, it presents lush outdoor landscapes the likes of which have never been seen so far—the realism is so spectacular that the end credits, playing over landscapes, are worth seeing by their own. It’s even more of a spectacular breakthrough considering that the film often takes place against expansive landscapes, far from the closed rooms of much of computer animation. The script manages to pack some emotion, the characters are often sympathetic, the story is neatly wrapped up and it’s short enough not to bore. Unfortunately, The Good Dinosaur is also a very basic film: The story is straightforward in a way that Pixar movies never are, going through formulaic plot points in strictly linear fashion. It reuses a big cliché of kids’ movies, and seems to be focusing its energy on fully realizing its landscape rather than buff the script. There are occasional touches of humour (“This is Dreamcrusher. He protects me from having unrealistic goals.”) that paradoxically remind us that this isn’t much of a funny film nor a particularly witty one. It is, in other words, a perfectly competent film that does not reach the next level that Pixar regularly achieved at their best. After Inside Out, The Good Dinosaur a disappointing retreat but hopefully not a sign of Pixar’s future—although their sequel-heavy upcoming slate isn’t exactly a good sign.